We have now reached the end of Book One of The Adventures of Damnation Kane. (Okay, we reached it last week; but I hate putting informational posts up directly after story posts; it pushes the story into the backseat, and I think it should always be driving. Which is probably why I’m unknown: story > marketing.) Starting next week, I’ll be posting chapters, a new one every Saturday, from Book Two, which includes a hospital, a hurricane, and a houngan; which sends Damnation to New York, into the Bermuda Triangle, and over the edge of madness. But that’s not the exciting part. The exciting part is that I will soon be publishing Damnation Kane, as an eBook through Smashwords.com, and as an actual paper book (I can’t tell you how excited I am about this) through lulu.com. The eBook will, for ease of use, be divided into four separate mini-books of about ten chapters each; the paperback will contain all of the chapters. In addition, I have written nine bonus chapters, never before seen, that will only be available in the published versions, not on this blog. They will be distributed throughout the four eBooks (Three in the first mini-book and two in each of the others) and all will be included in the paperback. These chapters tell parts of Damnation’s back story, and the stories of several of the other characters, particularly O’Flaherty and Burke, the leaders of the mutiny. These chapters are no small thing; each of them is longer than pretty much all of the regular chapters; there is a lot in there. I think they’ll make it worth buying the books even if you have kept up with the blog all along. Though of course, I think the book will be worth buying anyway. Right? As soon as I have the books ready for purchase, I will be taking the old chapters down from this blog. I’ll leave the first five or so, so that a newcomer to the story can get at least some idea of what’s going on; but otherwise, soon the only way to read Book One will be — to own Book One. I hope to have the books ready to go before the end of 2017, and I will post updates here and on the Facebook page. I am also considering getting my own website/domain name, and combining this serial with my blog. Thank you to everyone who has stopped in here and read my work. I hope you’ll consider buying it, as well. 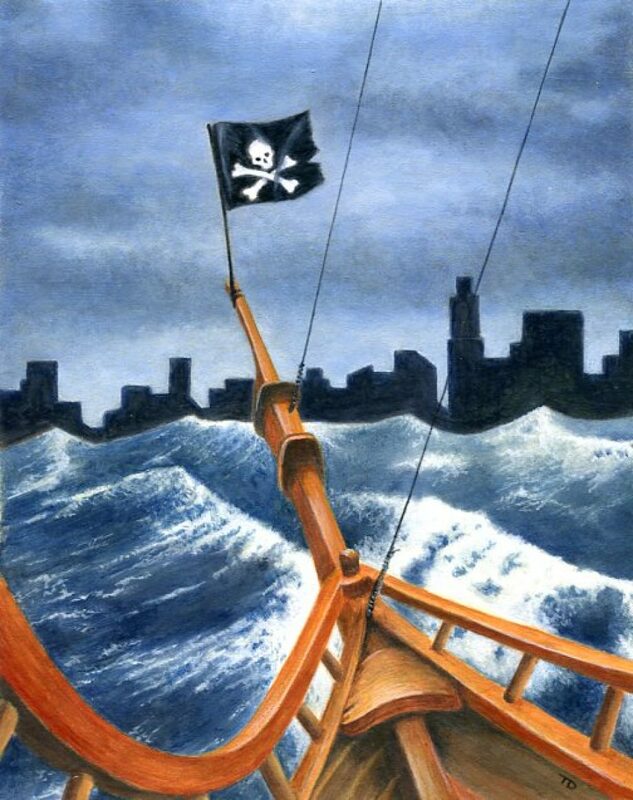 For the nonce, get yourself a print of this awesome ship at sea, done in ink wash by my wife, the brilliant Toni DeBiasi (Whose work adorns the header of this blog, and will most likely grace the cover of the book). Go to her Facebook page and click on Shop Now to purchase. (Give her a Like and a Follow, as well, because her work’s incredible.) Thanks!